We’ve Got Another Exciting Update: Keywords Can Do Just About Anything! Words are powerful; but here at CallTrackingMetrics, they can do things you wouldn’t believe. You’re probably familiar with triggers, our super-powerful tool that can automate just about any action – or set of actions – that you could take inside of our platform. A trigger, for example, could be set to send a notification to a call center manager every time the volume of incoming calls reaches above a custom threshold. Triggers can be set to take actions before, during, or after a call, and can even be applied only to specific tracking numbers. Well, we’ve just dialed the power of triggers up to 11 with our recent update to keyword spotting. Last week’s software update brought keyword spotting to both channels of our dual-audio calls, which meant that words could be detected on just the agent’s line, the caller’s line, or both at once. Our developers have been hard at work to strengthen this feature even more, by combining dual channel keyword spotting with the awesome intelligence of triggers. 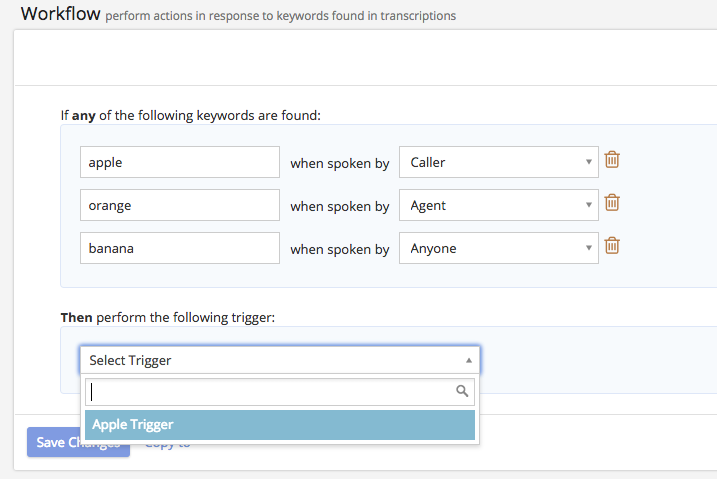 Now, if a caller or agent uses a certain keyword within a conversation, a trigger could automate any action based on that keyword: send an email, make an outbound call, create an event inside Salesforce, etc. Incredibly, this can all take place during the live call! Imagine how much time you could save, and how much valuable intelligence you could gather, by using triggers to automate actions based on specific keywords and speakers. We’re very excited to announce this feature, which will be live across our platform during the week of July 22nd.